I find myself reloading the components very often when developing on them. Maybe we should implement automatic reload of the components on building? Not sure about this idea. The performance penalty if this is done each time a component build. Also here at the studio the network is a little saturated and can add a few seconds to each build. Maybe as an option for development is a good idea. but not as default behaviour. Sorry yeah, meant it for component development mostly. Maybe we can store a “Reload components on build” option on the guide settings? Sure, that could be the way to go. What does the WIP mode do currently? is just a flag that you can use for anything you wish. If I recall correctly I am using it on leg_3joint to hide or show some joints used for the ik spring solver. @Toke_Stuart_Jepsen The WIP and FINAL modes are there for you to create two different configurations when building your own shifter componets. If I am not mistaken most of the current Shifter component don’t have that much config difference when building in WIP or Final but @Miquel know way better on this matter than I do but I do plan differenciate a lot on some components that I am writting as Wip mode on my side is like an unlocked verison of the rig with everything exposed for triggers as Final is the opposite with lots of things hidden and locked. 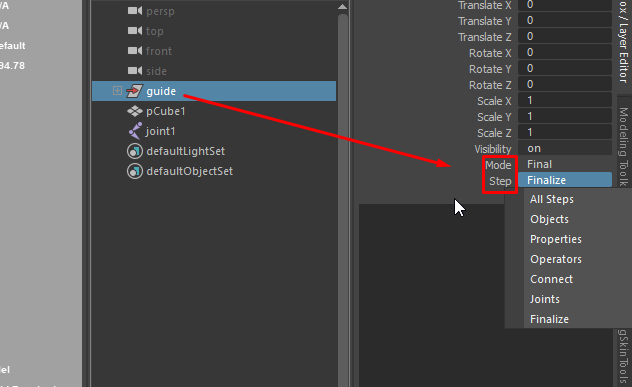 Another thing is that the Steps does execute on the order that you see on the list. This means that if you are creating the Objects you won’t have the Joints (please @Miquel correct my statements if I am wrong). correct my statements if I am wrong). Would it give greater flexibility for developers if reloading the components wasn’t tied to the WIP mode? With an option on the guide settings, it’ll become independent from the modes so developers can use it however they want.